1. Condition: New, Type: Tile Forming Machine. 2. Tile Type: Steel, Use: Roof. The roof tiles manufactured by our Glazed Metal Roof Tile Roll Forming Machine Production Line are beautiful and durable. They are widely used in gardens, factories, resorts, hotels, exhibition halls, vacationlands, ancient architectures and modern villas. 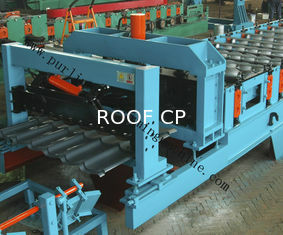 This Color Steel Roof Glazed Tile Roll Forming Machine can rollform metal roof tiles. After roll formed by this glazed roof tile roll forming machine, the surface of metal roof glazed tile is very smooth and beautiful without any scratch on the surface of tile profile sheets. The Steel Glazed Roof Tile Roll Forming Machine is with fully automatic control system with PLC. Length, quantity of sheets is adjustable. Roll forming process: Decoiler, Roll forming, Pressing & Cut to length. 1 Year warranty, lifelong time service. We also can do a custom roll forming machine, we can design machines according to your specifications and profile drawings, all our machines are customized. Material PPGI, Color Steel, GI. Our products are widely used in various industrial factory, civilian building, warehouse and easy steel building manufacturing, and have features such as nice appearance and durable.